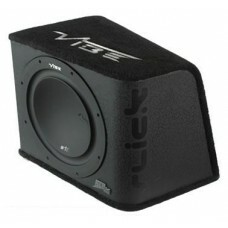 Vibe have created this totally unique, sealed enclosure with a 10" Slick subwoofer fitted as standard. the SLR enclosure has been tuned by the VIBE R&D department to ensure that it gets the ultimate sound out of the chosen woofer. The N Wedge design maximises transient response ­ in other words it reduces the negative effects that bass enclosure design can have on the performance of the subwoofer itself. The shape of the enclosure allows a smaller footprint taking up less space than conventional enclosures. The SLR enclosure also features a combination of the brand new, trademark finish from VIBE ­ RubberCrackle. The RubberCrackle is combined with hard wearing, heavy duty carpet to create a modern new enclosure finish.